Sonnō jōi wasn’t really a new concept that spontaneously erupted onto the political scene the moment Perry showed up in 1853 demanding that Japan open its doors. Perry’s expedition merely was a catalyst that began transforming political thought into action. Much of this discussion group will focus on this action, but before we do that, it may be helpful to take a look at the philosophies, the works and the some of the men behind them. What were the two main philosophies that formed the 'spiritual' backbone of sonnō jōi thought? What were their origins and how did these philosophies differ from each other? I'll start with just one, as I see it: The Mito-gaku brand of thinking (and those like it), which seemed to emphasize a nationalist feeling, backed by Neo-Confucian teachings and attempts to justify the contemporary social order in those terms. This promoted Shinto, and, by extension, the divine nature of the Emperor. I'd say that expelling the foreigners, for them, had to do with a combination of factors, including nationalist pride and a romantic view of history and tradition. I'll look through the sources when I get a chance and I'm not playing tour guide and try to put together a more coherent explanation of my gut feeling here. To clarify, the discussion will be here. Absolutely no part of it will be on the Yahoo group site. The only reason you were required to join it was to be able to get access to the resource pack in the "files" section. Mitogaku and Kokugaku: both hold the Emperor as the natural head of the order of things in Japan; Mitogaku seemed to be more centered on Neo-Confucian values and the natural order to be promulgated by a properly functioning autonomous domain; it also looked to arise out of problems inherent in the long-term imbalances caused by the movement of samurai off the land and into cities, the resultant rise of "money culture" and problems caused to the rural populace as well. Kokugaku also raised the Emperor to be the subject of reverence in more of a religious way and the thoughts of a restoration of the natural order through "government as ceremony," tying in the function of the populace and society with ancient deities and purely "Japanese" values of antiquity. I think these 2 schools of thought were similar in many ways, but Kokugaku seemed to be less concrete and more of a romantic conceit than Mitogaku, which specifically addressed the problems of the day (from early 19th century to the days of the Bakumatsu). Basically, both revered the Emperor, but the "expel the barbarians" aspect I think developed continually and wasn't really at the heart of Mitogaku (Kokugaku seemed to think everything not specifically Japanese was barbarian, including what they refer to as "Chinese-mindedness." ) Edit: I should correct my statement about the Mitogaku version of "Sonno joi" as it was stated as such explicitly, but the expulsion is also said to refer to the exclusion of "outside influence," which I suppose can refer to anything that upsets the balance they're trying to establish, not just Westerners but any destabilizing influence. Of course, there was also a contingent of Western Learning that developed alongside these philosophies and probably made its slow infiltration through recognition of practicality (i.e. coastal defenses, scientific advances, etc. as recognized by forward thinkers like Nariakira, Katsu, et. al ). Even Mito had a guy who had been charged with developing knowledge of Western Learning. and to provide assistance, relief, tranquility, and the semblance of safety to needy peasants. It was within this framework that the foreign intrusion, which had already begun at the turn of the century, was added as one more sign confirming the generally held belief that the realm was doomed. and the new religions announced the establishment of new forms of sacred communalism in their effort to give permanence to a conception of epiphany and the liminal moment. I hope this isn't too much of a rambling answer, but I wanted to illustrate the rise of these schools of thought not only out of the Western threat but the internal imbalances of Tokugawa Japan as well. What John wrote is interesting, and in a very base way, correct. “Sonnō”, as he pointed out, is a tenet that runs throughout Japanese history, starting with the foundation of the Yamato dynasty. But really, from the time of Taira Kiyomori onwards, it was just a concept that people paid lip service to as imperial decrees become just a mere means to symbolically legitimize rule by others. Elements of jōi, were also present from an early period as is evident with the creation of the post of sei-i-tai-shogun (barbarian-quelling-generalissimo) in the early Heian period, around the year 794. However, sonnō jōi, as an Edo period phenomenon, really is a convergence of tenets exposed in both Mitogaku and Kokugaku. Josh and especially Onnamusha covered a lot of the material on the two philosophies. But I would like to see if somebody could very neatly tidy up definitions of both philosophies as well as highlight the main differences between the two. Also, where did these philosophies come from? Who was expounding them? What were some of the influential writings? You're dancing to the right music, but still quite aren't in the groove yet, John. You've hit the peripheral differences, but not the main ones. To answer this, we've got to perhaps take a quick look at some of the popular works that helped define these schools of thought. I didn't have a lot on this topic in the resource pack, but the answer can be found by leafing through many of the books that are on the reading list. Let's see if anyone else can flesh this out. Kokugaku and the Mito School. I think these are both quite confusing and it’s good to have several approaches – here’s mine. Both perhaps arose as a reaction to the excessive ri of Neo-Confucianism in the mid 18th century. People felt a need for a new assessment of what it meant to be Japanese, as well as the need to explain and cope with disasters, hardship and the indifference or incompetence of government at both han and bakufu levels. Some scholars turned to a reappraisal of ancient texts (National Learning or Kokugaku) and the Shinto revival. Not that Shinto had been dead in any way. It was the mainspring of village life, and the belief system that held rural communities together: kokugaku blends in well with community actions like financial self-help groups. One of its aims was the enrichment of peasants, who were then expected to render aid to their villages. Famous names in kokugaku are Kamo Mabushi (1697-1769) who was a big fan of the Manyôshû, seeing it as untainted by non-Japanese influences; he wrote poetry in the same style which won the movement a large number of followers, Motoori Norinaga (1730-1801) who tried to elevate the Kojiki to a place of importance, valued the emotional and irrational as quintessentially Japanese, and loved The Tale of Genji for its mono no aware (and incidentally rescued Genji from being a Buddhist object lesson). The last and most significant for the period under discussion is Hirata Atsutane (1776-1843) Like many of the later sonnô jôi fanatics, Hirata was ambivalent and irrational in his beliefs and opinions. He hated foreign influences but was interested in Western science and medicine, particularly astronomy. It’s even thought that he read Christian texts in Chinese translations, and borrowed ideas from Christianity as well as Buddhism to support the superior claims of Shinto. The Mito school was founded in the 17th c by Tokugawa Mitsukuni in order to compile a history of Japan. It took many years to complete this task and during this time the school became a centre for intellectual discussion and the development of new ideas. This fervour came to a head under Tokugawa Nariaki. Nariaki was particularly concerned with the breakdown of society and the inability of the bakufu to deal with it. He felt maintaining a strong han was the microcosm on which the nation should be modelled. His economic and anti-sumptuary strictures are well known. The Mito school developed a number of doctrines that sought to combine Confucianism, the samurai spirit and Shinto, learning and martial spirit, loyalty to the family and loyalty to the nation. Their reviewing of national history led them to emphasise the concept by which the shogun held his power, which was to expel barbarians, and to realise the unifying force of the Emperor throughout the ages. Key scholars were Fujita Tôko and Aizawa Seishisai. Aizawa is credited with introducing the concept of kokutai, the divine national polity – the word became so loaded it was virtually banned after WW2. I don’t think I could define either in a pithy sentence. Both gained great energy and power from their emphasis on Japan as a divine country favoured by the Sun Goddess. I suppose the main difference, as I think Onnamusha is saying, is that kokugaku’s influence was more at a village level whereas the Mito school was a national player. There’s a lot of good stuff in Heron’s post. She’s done an excellent job! I think, though, for the sake of my own peace of mind and that of some others, I want to try to rub some tenderizer on kokugaku and Mitogaku to soften them up in order to make these philosophies easier to chew and digest. I don’t know if I will succeed, but here’s my take. 1. Kokugaku, simply translated, means “national learning” and concerned itself with the study and elevation of the writings, systems and beliefs of ancient Japan—before the culture became infiltrated by foreign influences. ]Kokugaku grew as a backlash against the neo-Confucian philosophy of the Bakufu (known as kangaku). I like to break kokugaku into two phases: early kokugaku and later kokugaku. Expanding on my above simple definition, early kokugaku concerned itself the study of the writings and literature from ancient Japan, suggesting that Japan had its own rich and “pure” history and traditions to draw upon instead of borrowing Confucian thought or other ideas and philosophies from “inferior” nations. Following on Onna’s earlier comment that kokugaku was a philosophy for the commoner, it is important to note the non-samurai roots of kokugaku’s, early proponents. Many of them were Shinto priests, such as Kada no Azumamoro (1669–1736) and Kamo no Mabuchi (1697 -1769). Motoori Norinaga (1730-1801), who wrote Kokuikō (A Study of the Idea of Our Country) was from a merchant family. Perhaps it was because of these non-samurai roots that kokugaku gained popularity among the non-warrior classes of 18th -19th century Japan. After all, according to Jansen, Motoori supposedly had over 500 disciples spread over 40 provinces. Also, Motoori’s teachings were basic and easy to understand without all the moral ‘messiness’ of Confucian and Buddhist philosophies. The gist of Motoori’s teachings is that man should be accepted as he is, and doesn’t need to be molded into something artificial, as he felt both Buddhism and Confucianism try to do. Motoori also strongly believed in the creation theory as described in the Kojiki, and took the writings of this book to be literal. Therefore, the emperor is truly a direct link to the sun goddess Amaterasu and is of a divine origin. While Motoori didn’t use his beliefs to push any particular zealot-like religious or political agendas, we do see this in what I call ‘later kokugaku’, as espoused by Hirata Atsutane (1776-1843). Heron already did a very good job covering Hirata, but I’d like to reiterate that it was because of his teachings, that his brand of kokugaku spread in popularity among the villages and farming communities and it’s not difficult to see why. We know that the worship of Shinto rituals played key roles in the Japanese culture associated with rice cultivation, yes? So, what Hirata did was firmly intertwine Shinto religious practices and politics with kokugaku by stressing the importance of matsurigoto, which links Shinto with government via the imperial system. Under the concept of matsurigoto, the emperor, as the descendent of the gods, honors them via Shinto rites, and in return, they assist him in looking after the welfare of the Japanese people. As the rural populace was already familiar with Shinto rites as they permeated daily agrarian activities, it wasn’t so difficult to grasp the political side of his kokugaku thought. Hirata had some wild hare ideas that I won’t bother delving into that he used to prop up his belief in the superiority of native Japanese culture and religion, but of Shinto and politics, I think it is safe to say he helped reinvigorate the importance of the emperor’s position within society and culture among the non-samurai classes. Thus the seedlings for the support of sonnō jōi were planted among the rural population. All that was needed for these seeds to take root was a deluge, which would soon come in the aftermath of Perry’s visit. As for the samurai, kokugaku also had a profound influence on their thinking that in turn, shaped how they rallied to the sonnō jōi banner. To understand this, we need to look at Mitogaku. 2. Mitogaku simply translated, means “Mito learning” and concerned itself with taking the core tenets of kokugaku and blending them with modified ideals of kangaku to create an idealistic approach to how Japan should be governed at both at the local han and national levels, centering around a concept of loyalty and duty. Essentially, Mitogaku is a marriage of Japanese nativism with the neo-Confucian beliefs expounded by the Bakufu and studied by the samurai. Heron’s already done an excellent job describing the background behind Mitogaku. Rather than rephrase what she’s wrote, I would like to instead cover the following points on where Mitogaku differed from kokugaku and from where Mitogaku’s brand of Confucian societal structure differed from that of the Bakufu’s kangaku. Mitogaku, in its earliest form and as how it was envisaged by Mito Komon (Tokugawa Mitsukuni) was basically an inert train of thought that sought to explain the history of Japan in a wrapping that went hand in glove with the kangaku inclinations of the Bakufu. However, by the 1830s, a series of seismic shocks began to rock the calm façade of Tokugawa Japan. These ‘quakes’ manifested themselves in the form of increasing numbers of peasant revolts, famine, and unwelcomed encounters with Western nations. The quakes in turn triggered ripples within Mitogaku scholarship, effectively transforming the school into an active agent of change that sought to revitalize the relationship between those who govern and the national polity. 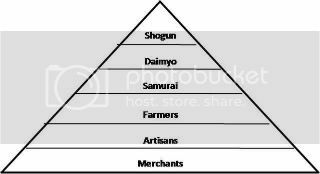 In traditional Tokugawa Confucian thought, society was based on the following social pyramid that I’ve drawn. With the Shogun at the top, all loyalty and feelings of duty or obligation thus flowed upwards. 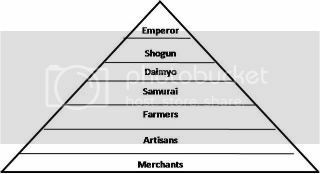 However, in the later version of Mito learning, it was taught that Japanese society should be arranged along the below structure. Here, we see that the emperor has replaced the shogun at the top of the pyramid. Well, I hope this explanation has been helpful and supplemental to the other posts from the participants. Each and every one of the previous posts has been valuable and made it easy for me to come in and try to sum it all up. I also hope that this has helped to show the links between these philosophies and the sonnō jōi movement. Thoughts? Questions? Please share them before we move on. It does seem that both Mitogaku and Kokugaku sought to marry politics and religious sensibility in a way that legitimated more participation in the affairs of the realm as a personal mandate (on the part of the samurai and officials of domains in Mitogaku and the commoners vis a vis their village politics in Kokugaku) . This tying of the numinous to the historical and tying of the individual to the fate and fortune of the realm seemed to underlie the later policies of direct action that would arise in the 1860’s. The perceived failures of the bakufu to fulfill the directives of the understood principles of sonno joi led many to take direct action under the auspices of either or both of these schools of thought. Mitogaku was the underpinning of Yoshida Shoin’s call to action (the bakufu's failure to uphold its mandate from the Emperor calling for answer through meritorious action--throwing out the incompetents), while the priest Maki Izumi’s call seems to jibe more with the Shinto-centric Kokugaku, although he was nominally a follower of Mitogaku--thus the two schools seemed to move closer together in some ways--direct action here being a sacred duty in service of the emperor to punish the bakufu for its wavering and the barbarians for their unceremonious behavior. But, more and more, the ideas of a society legitimated by numinous principles led to the awakening of both samurai and commoner to pursue direct action in the idea of restoration (to an ideal state, not necessarily to the Restoration which came to pass). Many of them were Shinto priests, such as Kada no Azumamoro (1669–1736) and Kamo no Mabuchi (1697 -1769). Motoori Norinaga (1730-1801), who wrote Kokuikō (A Study of the Idea of Our Country) was from a merchant family. Perhaps it was because of these non-samurai roots that kokugaku gained popularity among the non-warrior classes of 18th -19th century Japan.. I hope my take on this doesn't come off as too hare-brained, but as I went over the tenets and mindset of Kokugaku, something occurred to me from a far province that seemed as if it might tie in indirectly and yet ideologically in a similar vein. Basically, it is how a Kokugaku-like philosophy might propagate in an intermediate stratum such as the loyalists surrounding Takechi Zuizan in Tosa. The various han often had private schools (shijuku) at which the sons of samurai and higher ranking commoners were schooled, and in the case of Tosa han, the shijuku emphasis on the standard Neo-Confucian curriculum was transmitted in Tosa through the teachings of Tani Shinzan, who had absorbed more of the Shinto emphasis of Yamazaki Ansai’s Neo-Confucianism and has expressed the view that Japanese studies should be the basis of all intellectual activity and that Chinese learning should be added only after the Japanese (national) learning had been mastered. Others there rejected Chinese teachings altogether, namely Kamochi Masazumi, uncle and teacher of Takechi Zuizan, whose activities helped to create the chaotic atmosphere in Kyoto in the 1860’s. Thus, one might theorize that this could be a sort of alternate branch of Kokugaku, not of that name, however, having many of the same underlying tenets and prejudices as Hirata’s teachings would have on the commoner populace. Only, in the Tosa case, the actors were both goshi and commoner, forming a sort of link with the higher-ups--in Takechi’s case, bringing him into contact with the court in Kyoto, albeit briefly and peripherally. Ok, tell me if this is hare-brained or if there is truth to be gleaned here. Also, as a footnote, in Craig's book Choshu in the Meiji Restoration, it is noted that there are only a few Kokugaku (Hirata school) followers in Tosa, 6 during Hirata's lifetime and 17 thereafter (before Meiji). I wonder if, somehow, the name "Kokugaku" and the emphasis on Hirata Atsutane specifically might be ignoring other, parallel modes of thought throughout the country, such as this very similar philosophy that seemed to help create the ideas of the Bokuryu Sensei, Takechi Zuizan. I feel another Bakumatsu headache coming on. Where's the Advil? There's some interesting ideas in your post, Onna, but I honestly can't comment on it in too much detail. Of course, Hirata wasn't the only one preaching the kokugaku gospel and there were other proponents at local levels that held similar beliefs. But still, these schools would probably still be considered to fall under the kokugaku umbrella if we had to apply a label. I think it may be best we stop looking down the hare holes for a bit or else you will turn the world order upside down and have us all start chanting "ee janaika". I think we can just about close out the first point on the outline and get to the second module, in which we'll take a look at the rise of active sonnō jōi cells in some of the major han. That will happen after we first talk about some of the sparks that lit the sōnjō, as well as the role that Tokugawa Nariaki, Yoshida Shoin, and others played in fanning those flames. Late to the discussion as always, but have arrived. I'd like to take some time to read up here on whats already been said, but I'll be jumping in shortly. While I hope to be involved a bit more in a couple of days, I'd like to add that Kokugaku's elevation of Shinto over Buddhism had very practical uses for rebellious elements (as did the 'sonno' element). Buddhist temples were seen by enemies of the Bakufu (as well as many of the common people) as being the agents of the Tokugawa. This had to do with temples being the locations that kept family registries (in effect, keeping tabs on everyone) and also their responsibility for turning in whatever Christians might pop up. There was also the matter of temples being a major player in the ranks of moneylenders. Townspeople and samurai who took out loans and were unable to pay them back thus found Kokugaku's elevation of Shinto at the expense of Buddhism attractive, both on a theoretical and practical basis. It gave the Bakufu's opponents another justification to fight. Much like modern politics, fancy theories tended to lend themselves out as excuses for those hunting for one (on both sides of the issue). Excellent point, Tatsunoshi. You are very correct in pointing this out. Thanks for bringing this additional dimension to the conversation! Nah, I really don't want to go there, John. Otherwise we'll start debating pretty much the entire 18th century history of Edo Japan through the 1840s. Sorry, we don't have time for that. All those things that happened definitely weakened Bakufu power over a protracted period of time, but the real trigger, or the last straw, was the perceived threat, real or imagined, from foreigners. If the there wasn't a foreigner 'issue' then there wouldn't have been a lot of hoopla concerning jōi, and we'd be talking only about 'sonnō'. If I was writing a book about the history 'sonjō', I'd have a chapter or two or even three about all these things, but from a time point of view, we just don't have enough to delve into all of it. If we tried, this discussion group would probably end sometime next year! Let's stick to the outline. Thanks. Heron, I think you are on the right track--the shrines just aren't as spacious as the Buddhist temples. With some exceptions, where would you quarter people? That said, temples allowing various bands to encamp within their grounds is not new. In fact, there are several times in history, as I recall, that the temples have internal struggles about which side to allow inside and then even a case of minor rebellion where they later decided to revoke their hospitality. I'm not sure that I see the temples has having a 'pro-Bakufu' tenor as much as the Bakufu seems anti-Shinto. Considering that the roots of Shinto as an organized, national religion are deeply tied to the sacralizing of Temmu as the first 'Tennou'. I believe the Jingikan, which was the official arm of the government to organize and deal with all the shrines, was still under the direction of the court. This would make it more enticing to those upholding sonno. honganji did everything they could to get rid of the Shinsengumi when they set up shop at their temple? One other general point I'd like to make is that the temples themselves were for the most part not anti-Shinto (as many still had shrines on their grounds). During the Edo period, though, supporting the Bakufu (who, after all, were helping the temples become quite wealthy) took on a much higher import than helping out the shrines. Although they may not have been anti-Shinto, when were they decoupled? For instance, Kasuga Taisha used to be part of Kofukuji, and later they were forced to split up and work under separate religious administrations. I can't remember if that happened in the beginning of Edo or Meiji. And this thread is getting off topic. Let's ensure it doesn't stray any further.